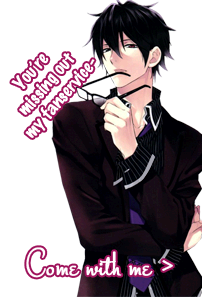 Re: Your first otome game? My first otome game was Yo-jin-bo. It was highly entertaining. Ok, it was really funny. My first was Hoshi no furu Toki from Otomate. Just addicted to the arts in this game. That was my first time I knew Kazuki Yone. My first otome game (only recently played!) was Always Remember Me on Android. It was closely followed by re:Alistair which I LOVED. They both remain two of my favorites. I first started looking into otome games when I was watching La Corda d'Oro and realized the anime wouldn't give me a satisfying conclusion because it was meant to hook you on the game. So I went to look for it and - sadly - found out it was only in Japanese. I still tried to play it on an emulator, but no luck. (°□°) Did you play it in Japanese or in English? Now I'm off to search the forum to see if someone knows how to get this in English or even how to get it to work at all. -- My first otome game was almost Hakuoki - Demon of the Fleeting Blossom - but I can't get the text to show up properly on my emulator. The first game i've ever played is Be My Princess for GREE. It was the first time i heard of otome games and the name of it ^^; I then discovered englishotomegames on tumblr and found out even more games! It seems that Re: Alistair++ brought quite a lot of light and attention to the Visual novel and Otome world. XD That was one of the first ones I've played as well. Before that I believe I've played some others, but I had no idea about VNs back then, so I never realized what I was actually playing-lol. Mine was Starry Sky in Spring; it was so fun and pretty much dragged me into this fanbase. I heard of a lot more titles after I did more research haha. and Re: Alistair++ that brown haired dude was actually very cute. Last year my friend showed up to fencing practice all worked up and freaked out because she'd been playing a game where she was dating pigeons and her character had been murdered. Mine was Meine Leibe or however you spell it, that weird shoujo manga turned GBA otome game (yeah...GBA). Back in the day when I was like 'hey bishounen, hey squiggly lines, hey why's the guy I'm after suddenly go with that chick....'. ( ༎ຶ ◡༎ຶ) Rejected by 2D. My first otome game was Tokimeki Memorial GS1 for the Nintendo DS. Sadly, it was in Japanese but I managed to make it out okay. Amnesia >//< I want to play! But, I'm not PsP.. I'm actually having trouble remembering my first Otome. Well, I know I got onto the Otome path playing harvest moon, I enjoyed dating the pretty girls and thought to myself, "Man, I wish I could play as the pretty lady, and get the men~"
Low and Behold DS Cute came to be a part of my collection and thus I spiraled into an uncontrollable obsession. Tokimeki was the first otome I understood and played with success.